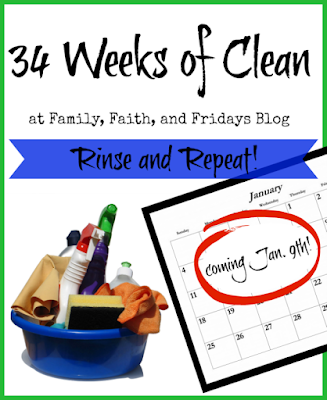 34 Weeks of Clean Returns! OK ya'll, I have to tell you how excited I am about this! Like, REALLY excited. For several reasons! First of all, my house desperately needs to be cleaned, purged, and organized. We have been here just over a year and it is starting to show! WHAT IS 34 WEEKS OF CLEAN? It is about deep cleaning every space of your house. It is about decluttering those spaces. And finally, it is about re-organizing those spaces. One week at a time. One space at a time! You CAN do it! Our first run of 34 Weeks of Clean proved to be helpful to many. With a little hard work and a lot of cheering from friends, you too can take your house back! One of the things we hope to add to our book will be checklists for your convenience! If you have any other ideas of things you would like to see, or helpful hints that have worked for you, feel free to give me a shout out! Maybe you will even get to see your name in lights print! Soooooooooooooooooooo, all that being said- see ya back January 9th as we put away the holiday decorations and face a New Year! Be ready to clean, purge, and organize your house back into shape! Welcome back to the fun! We have been blown away by the response to our first two giveaways, so we are thrilled to be able to offer one more just for grins. Don't forget our Elementary Bundle Giveaway closes Monday Dec. 26th and our Highschool Bundle Giveaway closes Wednesday Dec. 28th so there is still time to enter! There are TWO THREE different bundles you can win! You can enter to win all, but we will make sure to award TWO THREE different people as the winners. You supply your address, and I will ship it to you for FREE. It is our gift to you! We would love for you to share this post, and visit and like our Family, Faith and Fridays FB page, but none of that is mandatory. This giveaway is open to US shipping address only! If you leave a comment, PLEASE make sure you leave a way for us to reach you if you are the winner!! Homeschool Christmas Giveaway- High School Bundle! We have had so much excitement over our Elementary Bundle Giveaway (you can still enter to win that as well! ), that we decided to do TWO more bundles. Today is a high school bundle. Pop back in on Friday for a bonus Middle School Bundle! Who wants to win? Enter the rafflecopter below! As a reviewer of homeschool curriculum we are blessed with a lot of amazing products. Many we keep and use, but there are often great products that we simply cannot make room for, have duplicates of, or that are for different grade levels than we have in our home now. Because of that, my stack of unused curriculum sometimes grows taller than we would like. That's where you luck out! It is time to move it out, and I figured what better way to do so than to bless two of our readers with some fun new stuff for their homeschooling needs? There are TWO different bundles you can win! You can enter to win both, but we will make sure to award TWO different people as the winners. Foreign Language for Kids by Kids- Spanish Level 1- DVD, workbook and stickers! Come back on Wednesday to see the Middle School/High School Homeschool Bundle and enter for that drawing! Or at least can we pretend it is snowing? Only one snow here and it is gone, but the temperatures are beginning to fall, so here's hoping! In the meantime, we are decorating the house. Can I tell you how excited I am? We do not usually get stuff out until the second week in December, but, hey, one can change plans, right? Last year if you recall we moved into our house the week before Christmas. Just weeks after our hero had returned home after a year deployment. 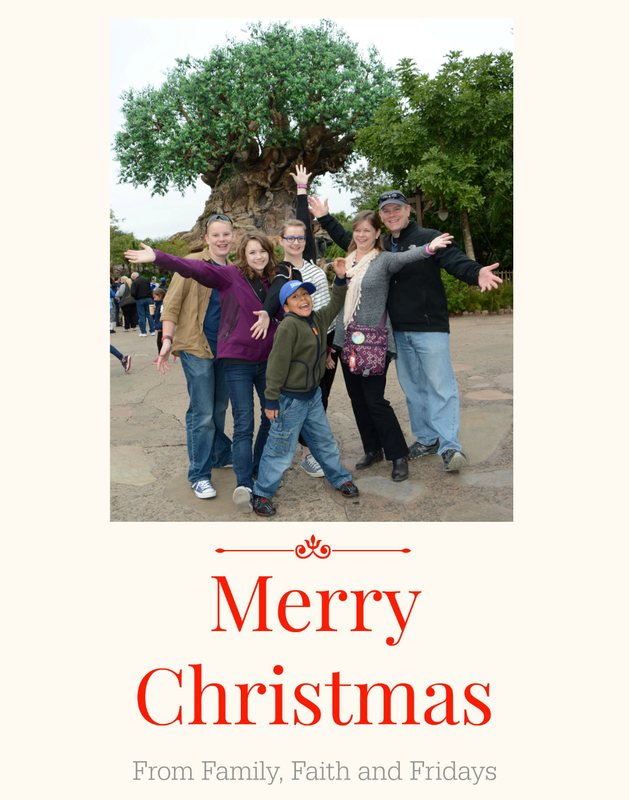 It was a crazy time and we only managed to get one quick tree up. We were busy trying to unpack boxes and get settled and I just couldn't think about adding a layer of Christmas stuff to the confusion. Hind sight, I might do things differently, but oh well. So this year, we are excited about decorating. After all, we haven't seen most of the stuff in two years. This is also the year where we are determined to weed through stuff (we being me and Ashton) and update a few things. Since there are not any "littles" in our house anymore, some things are ready to be moved on to someone else who can love and enjoy them. The Nutcrackers stay, as they are memories of my dancing days and all the years I performed in the Nutcracker Ballet. The snowmen are being dispersed and only a few of my favorites are staying! The mantle is getting a new look because, well, last year we did not even have a mantle! And we cannot forget my new centerpiece Ashton made for me! WHEW, I am tired! Time to snuggle up by the fire with a Christmas book! We will talk about those traditions in the next few days. I love Christmas! Do you? The biggest news is that the girl is home!! I imagine some people may have heard us cheering as she stepped off the plane. Not having her home for Thanksgiving was challenging, so I was so relieved to see her step off that plane a few days ago. 5 weeks people. She is home for 5 weeks. Did you hear the cheering again? Even the dogs are excited! So what's she been up to? School. A lot of school. But a lot of fun too! While I admit I do not love the fact that she is so far from home, I do love the fact that she is so happy where she is at. She loves the school, she loves her classes, and she loves her friends! It has been a great experience so far and although I know it will be hard to see her get on that plane in January, it makes my heart sing to know she is where she belongs with people she loves! 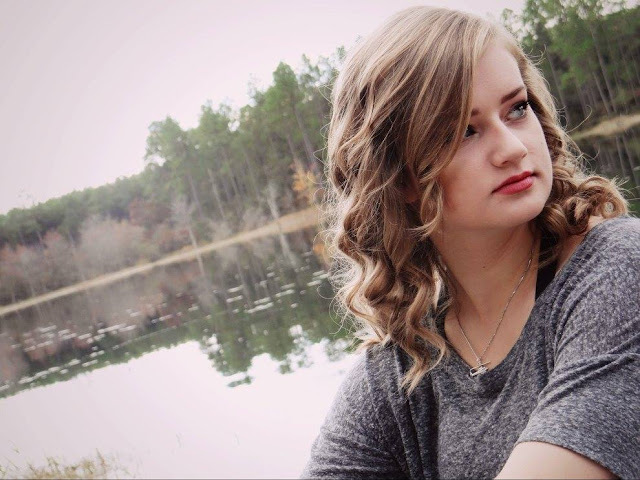 She is doing what God has called her to do! We are thrilled to be able to have her home for the holidays but also spoiled to have her home for her birthday as well! 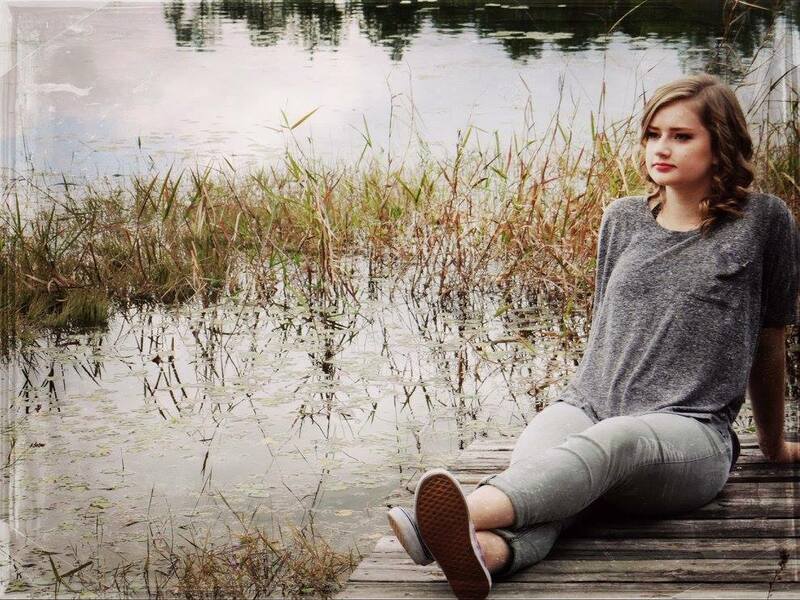 Happy 19th Birthday Riley! You are indeed loved! The joy you bring into our lives and others' is immeasurable. Your humor keeps us laughing, your joy is contagious, your talent inspires us, and your love for God fills our hearts. May the Lord continue to bless you and hold you close as you seek to follow Him! My family is not too big on traditions. Sometimes I wish we were but honestly with all of our moves, each holiday can often be quite different from the year before. Throw in a husband's crazy schedule and the fact that he has missed a few holidays here and there, and well, we do the best we can. We have also learned that being flexible can help keep disappointment at bay. It's all about the memories, right? Christmas Books! We have a basket of Christmas books we bring out each year and read through. Some we read together and others disappear to certain children's rooms for a period of time. We have even read most of them under the lights of the Christmas tree when the kids were younger. Each year we usually add at least one to our collection and someday I will look forward to reading them to grandchildren maybe. Advent devotions! Each year this looks a little different for us but we love the advent season. The anticipation of each week drawing closer to Christmas is just intensified when we focus on the birth of Jesus! Four years ago we discovered the books Jotham's Journey, Tabitha's Travels, Bartholomew's Passage and Ishtar's Odyssey. We cycled through reading them and began again this year with Jotham's Journey! Even the big kids will sit with us each night and read a quick chapter together during our family time. Such precious memories we are making. Nativities! We love putting up various Nativity scenes around the house. Some years they all make it out and other year we pick and choose, depending on the space. Each child also has a special one for their rooms that they will eventually take with them. Christmas Eve Buffet! After going to our church's Christmas Eve service we return home to a fun family dinner comprising of each person's favorite "fun" food! We let each person pick what they want and then that's what is for dinner. For the past several years we have invited others into our craziness, making it even more fun to see what everyone will choose. Someone in our family still votes yearly for ice cream, but we do try to encourage something with a little more nutritional value. I can tell you shrimp, bacon rapped water chestnuts, and crab dip always make the cut! Looking at Christmas lights! We do try to take one night to pile in the car and drive around looking at the lights in the neighborhood. I always thought it would be fun to do in our pajamas, but we have lived in some pretty cold places folks, and my hubby does not always entertain the same idea of fun as I do. Christmas morning coffee cake! My mom started this one for us about 6 or 7 years ago. She gave us this beautiful pie plate that has a recipe for coffee cake on it. Each Christmas morning we make it and enjoy a leisurely breakfast in between opening stockings and gifts. The only thing you have to watch for is that once you pour the batter in, you are out of luck for the icing recipe if you have not written it down before hand. Ask me how I know this! See? Simple but fun! And something we look forward to each December. How about you? What traditions do you have in your family? I told you before, I love Christmas! Every since I was a child and put out decorations with my mom I have loved the sights, smells, and sounds of Christmas! I remember my mom painstakingly arranging hundreds of lights on our Christmas tree each year. I loved to look at the tree through squinted eyes so you saw just one big blur of color. Now, in my own home, you can squint your eyes and see several big blurs of color! We have an Americana tree that we have put up for years. There is something about the red, white, and blue ornaments that makes me smile. It also helps us to remember the military members who are deployed and the families that are celebrating without them. We have been that family several times and we know how hard it can be. We are thankful for those who serve along side of us! Then there is my cross tree. I do not remember how this got started but I love adding to it each year. It really is a good reminder to us that Christ is indeed the whole reason for celebrating Christmas, without Him, there would be no holiday at all! Next up is our family tree. This tree has taken many different paths throughout the years. We had a monstrous artificial tree for the past few years but finally decided it took up way too much space so we passed it on. I just recently found a small tree with pinecones and berries that I adore. For now it remains empty, but when our college girl, Riley, gets home we will decorate it with her! This year I hope to weed through the years of collected family ornaments and downscale, keeping only the ones we really love and adore. I want this tree to speak of the memories we hold close to our hearts! Next- the kid's tree. The three olders used to decorate this together and have it in the hall near their bedrooms. Our youngest, Colby, has now taken it over and decorates it for his room! I think he just likes using the lights as a nightlight, but hey, if it works... right? Most of the ornaments were given to the kids by friends and grandparents or are homemade from church and preschool. This white, ceramic tree was made by my Aunt years ago and always finds a special place in our home. My cardinal tree sits on our front porch most of the winter months. The little red birds bring me almost as much joy as the real ones on the back deck! I do have one more small tree I think (shhhhh, don't tell my hubby!) that I may put our angel ornaments on if I can find a place to put it, but we will see! Until then, just imagine me walking around the house, eyes squinted, enjoying the lights! Next week I will share the rest of the decorations! 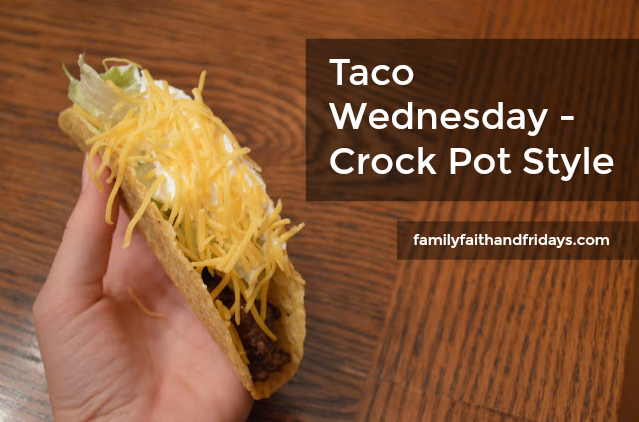 Taco Wednesday- Crock pot Style! OK, OK, I knew most people call it Taco Tuesday, but work with me here. Remember Wednesdays are about easy and quick. What could be easier and faster than tacos? 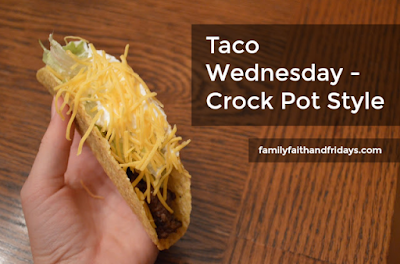 And since most kiddos like tacos, it is perfect for your busy nights. So, tacos in the crockpot? Yep, it's so easy! - Taco Seasoning - below I will share my homemade recipe which we make in batches and keep in our cupboard, but feel free to just rip open a package and dump it in! Cook on high 4 hours, or low for 6. Break up meat at end and make sure ingredients are mixed. You may need to add a little more water to keep it from being too dry. Serve it up with hard shells or soft tortillas, add some fruit and call your night a success! See, simple I told you! Mix all together and store in an airtight container. I do usually at least triple this recipe so we always have it ready. I vary the amount I use, depending on how much meat, but I would say use at least 1/8 cup per pound of meat.